Film Streams’ 2016 Local Filmmaker Showcase Is Go! The 2016 Local Filmmaker Showcase is at Film Streams until Thursday and not even a historic World Series is an excuse for you to miss it! It’s hard not to get a bit warm and fuzzy watching the showcase of 12 short films produced in Nebraska, Iowa and South Dakota. Seeing our vastly underfilmed region on the big screen, and such diverse perspectives from local filmmakers, is pretty much the coolest thing ever. One of my favorite films of the showcase was No Sleep, a grown-up riff on Pixar’s Inside Out that reveals what really happens to our bodies when we can’t get to sleep at night. It’s funny enough as a comedy, but the sheer scale of the production amazed me. Short films usually aren’t so expansive, and the digital effects in short films are rarely as convincing as the images in No Sleep. Davidson may not be working on the same scale as a techy filmmaker like Neill Blomkamp, but he clearly has a similar of understanding of how to use digital effects as storytelling tools. Undeniably the most urgent film of the showcase was Stones, a documentary that looks at advocates working to ensure the death penalty stays abolished in Nebraska. The last man executed in Nebraska, killed in 1997, left an impression on death penalty opponents that the documentary effectively captures through somber imagery. Of all the films, Sandi’s was certainly stood out as the heaviest. It’s inspiring to see a filmmaker tackle the type of controversial subject that fires up viewers with a sensibility that encourages empathy and discussion. Black Canaries seems destined to start a lot of conversations and maybe ignite a few arguments. The film has a layer of lyrical ambiguity that makes it seem less straightforward than it actually is, but Kreitzer creates a striking tribute to early-20th century Midwesterners that features the best cinematography of the showcase. It’s a short film that somehow finds a way to slow down, breathe a bit, and pace itself, without feeling sluggish. Fans of this year’s The VVitch will surely appreciate Kreitzer’s attention to historical detail, as the film looks and feels authentic at every moment. 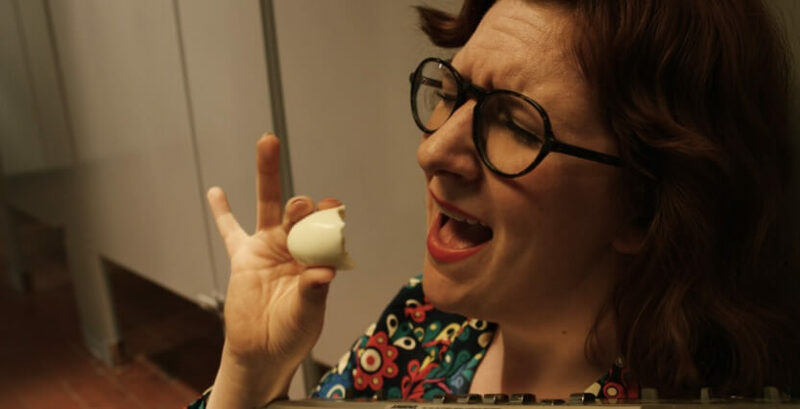 Director Tony Bonacci and writer Michelle Murphy bring some levity to the showcase with Barely Business, a comedy about an aspiring businesswoman fond of eating hardboiled eggs in public restrooms. Bonacci recently won the Omaha Film Festival’s 48 Film Challenge and, again, the director gets strong performances out charismatic actors to successfully create a performance-driven comedy. The two lead actresses have oddball chemistry that generates laughs throughout, even if it’s hard for me to watch anyone eat a hardboiled egg with hurling. Stop pretending like eating hardboiled eggs is okay. It’s disgusting! For the first time ever, Film Streams selected two films by primary and secondary school students to be featured in the showcase. The first film, The Person Beside You by Northwest High School’s THRIVE club, was an insightful documentary about drawing attention to serious mental illnesses that high school students often deal with. The other film was 9 Lives, directed by Omaha’s Ewan McFarland-Smith, an immeasurably adorable horror-thriller about a homicidal house cat. Both films indicated there are strong young film talents in the region! My favorite film of the showcase was One Day, One Month, One Year, an unconventional drama that is way too hard to describe, so I’ll just tell you to buckle in when it begins. Here’s a film making the connection between film and dance that takes full advantage of both as visual storytelling mediums, and the final result is tremendous. One Day, One Month, One Year is the kind of the film that you makes you regret only being able to see it for the first time ever just once. I absolutely loved this film. It benefits short films to be “high concept,” so it’s nice, for a change, to see a slice-of-life drama like Lost Nights. The film follows two brothers reverting to adolescent antics on the night before one of them leaves for military training. The film feels as grounded and authentic as any of the documentaries in the showcase, and Costello successfully hits emotional beats that are often difficult to manage. Lost Nights is an effective drama with a distinctly Middle American story. Another film with a distinctly Middle American story was The Simple Gift of Walnut Grove, my favorite documentary of the showcase. In the documentary, a 96-year-old man recounts the life of his Danish father who relocated to the Midwest in the early-20th century. As the man discusses the surprisingly harsh conditions of the early Midwest, a touching father-son story emerges that feels as traditionally American as steak and potatoes. Surprisingly, a documentary is the biggest heart-warmer of the showcase. Yet another one of my favorites of the showcase was The Woods, a completely dialogue-free horror film about a young woman on a dire quest in a frozen forest. So many horror films struggle to create believable emotional cores that it’s even more impressive when The Woods becomes one of the most personal horror films I’ve seen in years. If any of the film concepts in the showcase are ready to be adapted into a feature-length film, it’s this one. Over the Bridge is an advocate documentary, shedding light on homelessness in the Midwest and how our failed mental health system plays a key role in the issue. The documentary resonates because of interviews with actual homeless people living “over the bridge” in Sioux Falls, a district rampant with homelessness because it’s easily avoidable to passersby. It’s not a documentary that’s always easy to watch, but it’s vitally important. As someone who typically doesn’t like music videos, I really loved “Two Weeks.” It’s an inventive and stylish piece that follows a singer drifting between her daydreams of a fantasy life and her harsh reality. On top of the impressive visuals and vibrant energy, it helps that the music video is accompanied by one hell of a good song. “Two Weeks” is definitely a worthy closer to an exceptional filmmakers showcase. Again, a reminder: the 2016 Local Filmmakers Showcase is at Film Streams until Thursday. If you’re a film lover, or want to support local arts, give the showcase a look and you’re likely to be impressed by the quality of films in the program. The Local Filmmaker showcase helps foster film talent in the region, so make sure it continues by buying a ticket and seeing some great films by area artists. You’re sure to be surprised by just how much fun it can be watching films featuring landmarks and landscapes that you see everyday, and perspectives that you find all around you, when you head down to Film Streams for the showcase.